The purchasing power of middle class has definitely increased, but at the same time the cost of real estate is becoming dearer, making it tougher for commoners to own a home. It’s a common knowledge that there is a huge potential for real estate growth in India, wherein, the maximum demand still exists at the lower and mid-segment levels. 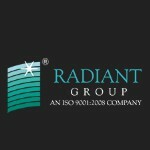 At Radiant, our strategy is to cater to this huge demand at the mid-segment level, a strategy that has brought us greater success since our inception days.